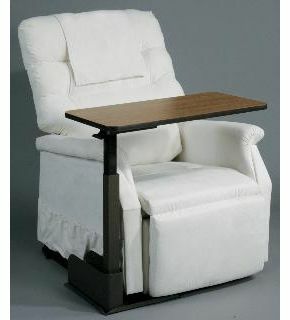 This Over Riser and Recline Chair Table is designed to work with most standard lift & recline chairs. 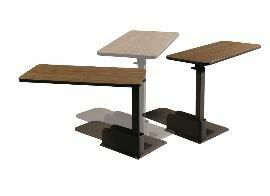 It works as a convenient height-adjustable over chair table that swivels in front of the chair when the user wants it and then easily swivels to the side to function as a side table when not in use. An excellent table for use with almost any rise and recline chair, this model comes with a sturdy bottom plate that easily slides under the chair base and uses the weight of the chair to secure the table in place. The Over Chair Table comes in an attractive brown, wrinkle coat finish for years of durable and aesthetically appealing use. The 501 is for use on the left side, and the 502 is for use on the right side. To adjust the table top height simply push down or push up. This table is excellent. I can easily get in and out of my chair now without having to push a table in front of me. It is a good sturdy table and I feel very safe with it. Very sturdy and well made; my dad's 90 and he can use it with ease. It would have been more helpful if the comment about lubrication had appeared at the appropriate part of the instructions, rather than find it when the table had already been put together. Once lubricated, the table worked well. Mum very pleased with it,easy to put together,great purchase.quick delivery. Very pleased with the table. My mum can now sit at a table to eat her lunch. Have this table unmade yet. Looks good, replacing a Stressless recliner and table. Need it for remote controls and mobile phone. Job for this weekend (possibly). Quick delivery,solid product,instructions a little vague,but overal very pleased. Amazing product, very strong and good value .